Seeders Instruments violin style banjo bridge. This bridge is handmade using quarter sawn Maple and Ebony. It takes influences from the traditional violin bridge and its unique sound and vibration transferring principles. 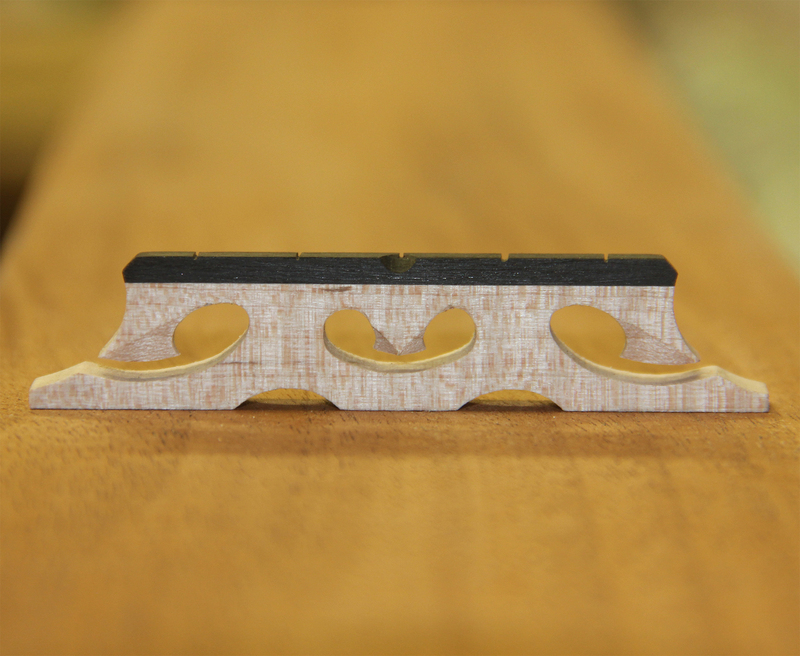 Every bridge has hand carved details and a compensated center string for improved intonation. Available in 1/2″, 9/16″, 5/8″, 11/16″, and 3/4″ bridge heights. I just got my new 11/16 Seeders Crowe-spaced compensated “fiddle” bridge. Not only is it beautiful, but I put it on my Nechville Custom Vintage and I will tell you, nothing could sound better! Get one now!!! Installed the Seeders violin style bridge on my Sullivan Vintage 35 mahogany banjo. I have used lots of custom bridges and this is one of the best. Cracks like dynamite, has a nice 4th string growl and lovely up the neck tones. Bright with increased note separation. Highly recommended. Put my Seeder Violin Bridge on my Deering John Hartford model and instantly loved what I heard! Great note separation, nice crispy pull offs, a nice deep fourth string, and an even balance in feel, and tone, across the strings. Look forward to what it will sound like as it continues to open up and settle in! Love it! Loving my new Seeder Banjo Bridges. Beautiful design plus a brighter sound out of my both my A-scale Bart Reiter and my 1960’s Ode. I highly recommend them to anyone wanting a visual and performance enhancement to their banjo. Thanks Will!